Placental mammals constitute the largest group of mammals. In placental mammals, fertilized eggs migrate to the uterus or to the uterine horns where they implant and begin to develop. In the process, a placenta is grown to act as the interface between mother and offspring. The highly vascular placenta then connects to growing embryos via the umbilical cord, and exchanges of nutrients and waste between mother and fetus occur in the placenta as fluids are not shared between mother and fetus in the womb. Not all placental mammals have the same reproduction scheme. 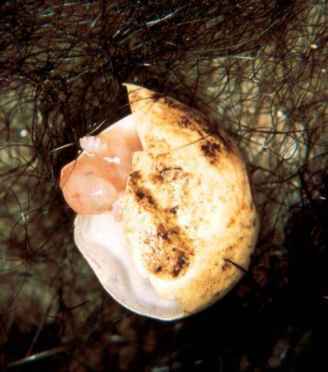 Most females have estrous cycles with well-defined "heat" periods and will only accept mates and breed during this period. The estrous period often is fairly conspicuous and recognized by mates through hormonal, pheromonal, or behavioral cues. Most mammals fit in this category, and best known examples may include deer, dogs, and otters. Primates are recognized by many as the most advanced mammals, possibly because of advanced cognitive skills and a larger brain relative to body size. Many primates including humans do not have an estrous cycle, but instead a menstrual cycle. The menstrual cycle typically leads to more frequent ovulation (every 28 days on average in humans) and considerable bleeding associated with breakdown of the endometrial lining in the uterus (menstruations). Moreover, females of advanced primate species including humans do not show clear sign of ovulation and in many females, ovulation fits into a process called the menstrual cycle. In this cycle, the uterus is prepared prior to ovulation, the egg or eggs are released several days later, and if fertilization does not occur, the lining of the uterus degenerates and is shed during a period called the menstruations. The combination of regular but hidden ovulation in females probably allow primates to evolve promiscuous mating systems because males cannot assess when ovulation occurs, and thus mate guarding either occurs throughout the year (monogamy in many human societies), or uncertainty of paternity leads to child care in large promiscuous groups (chimpanzees) and lessens the risk of infanticide.